What to do in the garden in July! What to do in the garden NOW! GARLIC: If you planted it last fall, it should be ready to harvest as the leaves start to turn brown and die back a bit. Hardneck varieties will produce scapes which should be trimmed off to allow for better bulb production. Don’t thrown them away, they can be sautéed and eaten or used in pesto. Harvested garlic should be hung to dry in a cool, dry place – think basement. HERBS: Trim back both perennial and annual herbs to prevent flowering. This helps to keep the plant compact and full. Use trimmings fresh, or hang to dry for use late, when you need that little reminder of summer. Make an herb paste using olive oil, garlic, salt, pepper and LOTS of mixed herbs. Rub it on a pork loin and then roast it on the grill….YUM! TOMATOES: Tomatoes going every which way? Selectively prune with clean clippers (10% bleach solution or alcohol wipe) to encourage controlled growth and better fruit production. Cut off suckers and dead leaves and stems. Keep an eye out for any disease processes. The CSU extension website can help you identify problems. There is also information about growing and caring for tomatoes. FERTILIZER: Tomatoes and corn would benefit from fertilization, they are heavy feeders. Top dressing with quality compost is ideal. You can also use a slow release,”organic” fertilizer. Read label for application rates as more is not necessarily better for the plant or the environment. SUCCESSION PLANTING: Continue planting bush beans and radishes for a later crop. Hold off on planting a second crop of cool season veggies such as lettuce, spinach, snow peas, etc. until the end of July/ beginning of August as it is just too hot for those plants. HARVESTING: All of the hard work finally pays off at harvest. 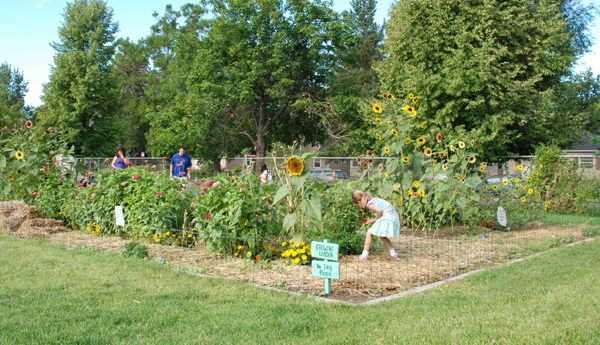 Check out this activity from the Slow Food USA’s Good, Clean and Fair curriculum.